Are you ready to kick off your holidays? Join Internationally Touring Psychic Medium, Apryl Nicole in a Winter Wonderland at The Potting Shed. 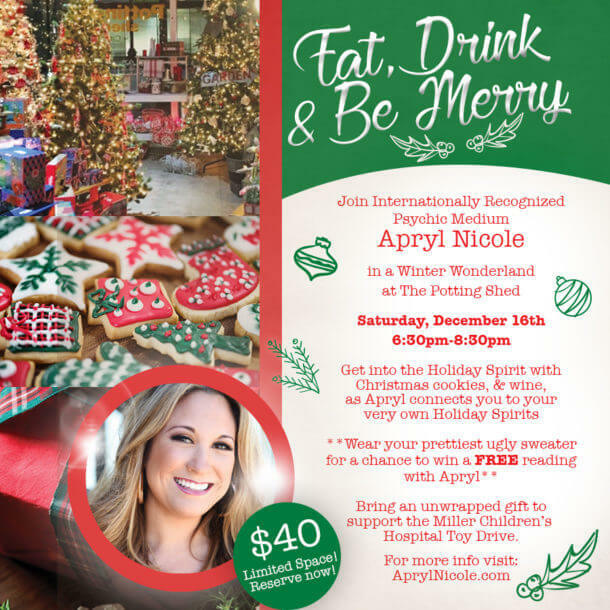 Get into the Holiday Spirit with Christmas cookies, and wine, as Apryl connects you to your very own Holiday Spirits. Wear your prettiest ugly sweater for a chance to win a FREE reading! Bring an unwrapped gift to support the Miller Children’s Hospital Toy Drive. 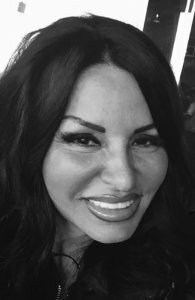 Apryl Nicole is an internationally recognized psychic medium based in California who has been able to communicate with spirit from age three. She works with her abilities to bring healing, closure, and blessings to those seeking insight and guidance. Apryl has been featured on Nat Geo Wild with Andre Milan, for her diverse abilities as an animal communicator. She is best known for her time as a Touring Medium in Japan along as being a featured guest in Japans Star People Magazine. Apryl has been a guest celebrity reader on many notable podcasts including Calling Out with Susan Pinsky. Amongst her many prestigious awards, Apryl is a proud recipient of the 2017 Social Activist Award with Best American Psychics and is the top rated psychic medium in Orange County.